How a star changes over its lifetime depends on two forces: the gravitational force pulling the star inwards and the force from the fusion pushing it outwards. Stars begin as nebulae, clouds of dust and gas that are pulled together by gravity. 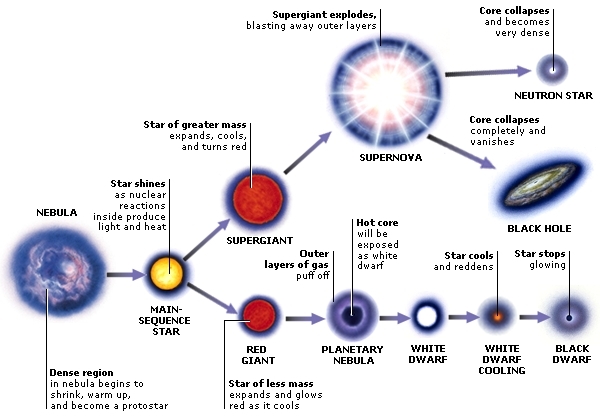 Fusion reactions begin and the become a main sequence star, like our own sun. At this point the star is fusing hydrogen to form helium. As the fuel for fusion runs out, the star has to start fusing helium. This produces a lot more pressure and the star expands and cools, turning into a red giant. How large a giant it becomes depends on its size: if it is small, like the sun, it becomes a red giant. If it's large, it becomes a supergiant. When a red supergiant runs out of fuel the force of gravity becomes much stronger than the fusion forces and so the star collapses in on itself. This sudden collapse makes it explode in a supernova. This supernova sends particles into space with immense energy. This is the only way that heavier elements such as iron and uranium can be formed. Because we have heavy elements in our solar system we know that it must have formed after a supernova: the outer layers are blasted away and can form a nebula and a new star. The inner layers shrink down and become a very dense core. The largest will collapse completely into a black hole and the smaller will become a neutron star. When a red giant runs out of fuel for fusion, it collapses, increasing the pressure which allows it to burn brighter as a smaller white dwarf. As this runs out of fuel, the white dwarf cools and glows red until it finally is left as a cold, black dward, a dead husk of a star.